As contrasts go, this one was pretty striking. 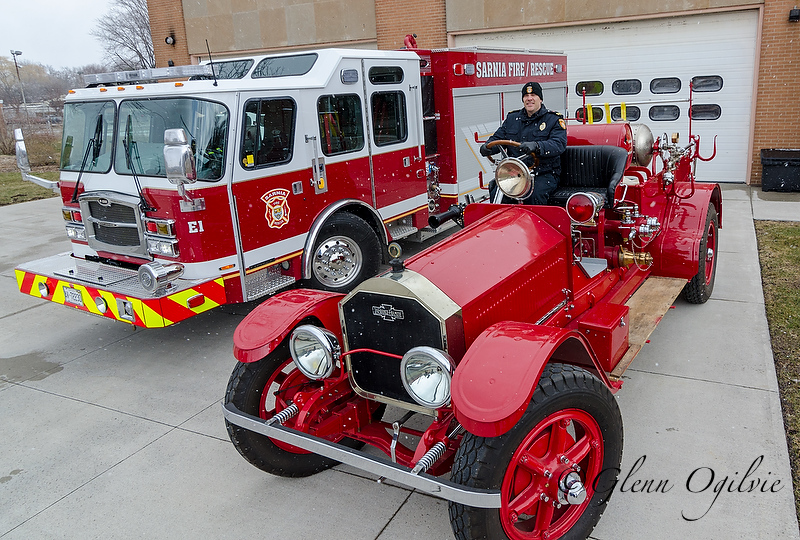 Last week, one of Sarnia’s very first fire engines – a 1921 American LaFrance-Foamlite – sat parked beside the city’s newest pumper at the East Street fire hall. 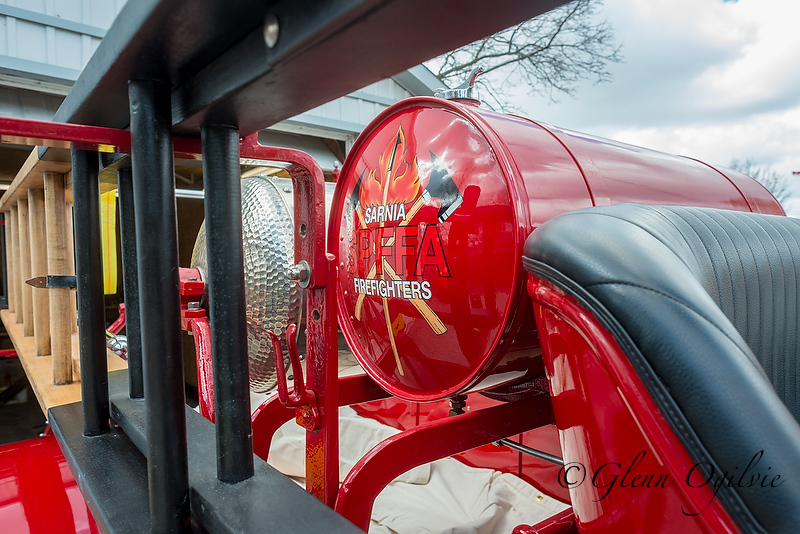 Sarnia’s last two firewagon horses, Barney and Mike, were retired in 1921, so the photo highlighted nearly 100 years of progress in the mechanization of Sarnia Fire Rescue. Firefighter Trevor Mitchell, who is currently heading up the restoration project, shows off the engine compartment. The new $650,000 pumper truck was put to work almost immediately when Sarnia firefighters battled a March 29 blaze on Ross Avenue that caused an estimated $200,000 in damage. The 450-horsepower pumper can pump 1,500 gallons per minute and carries 40 gallons of foam concentrate. With 600 feet of attack line hose and over 800 feet of five-inch supply line hose, it represents the very latest in firefighting technology. 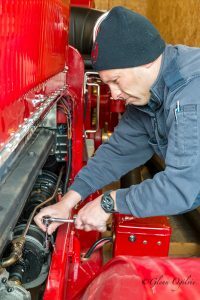 The old fire truck, with its gleaming with new bodywork and tended with loving care by the firefighters, is a tangible link with the city’s glorious 178-year firefighting past. It replaced the horses that once galloped furiously through the town’s streets drawing fire gear and was taken out of service in the 1950s. Stored for decades at the south-end’s No. 2 fire hall, the American LaFrance was acquired by the Sarnia Professional Fire Fighters Association in 1997, and a major and ongoing renovation project began in 2005. 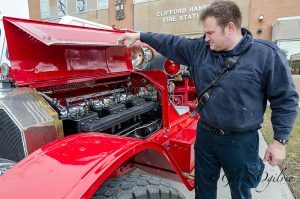 Firefighter Russ Elliott works on the electrical system of the vintage vehicle. “We’d work on her until we ran out of money and, when we got more, we’d be back at it,” said Fire Captain Chris (Tug) McGrath. The estates of deceased firefighters George Leader and Graham Emslie both left donations to keep the project progressing. J & J Body Shop worked on the vehicle and refused to present a bill, and other companies were similarly helpful. And dozens of firefighters, led first retired firefighter Howard Longley and now by firefighter Trevor Mitchell, have put time and energy into the loving restoration, which has cost $40,000 to $50,000. The firefighters have a tradition of giving retiring colleagues a last ride home on a fire truck. 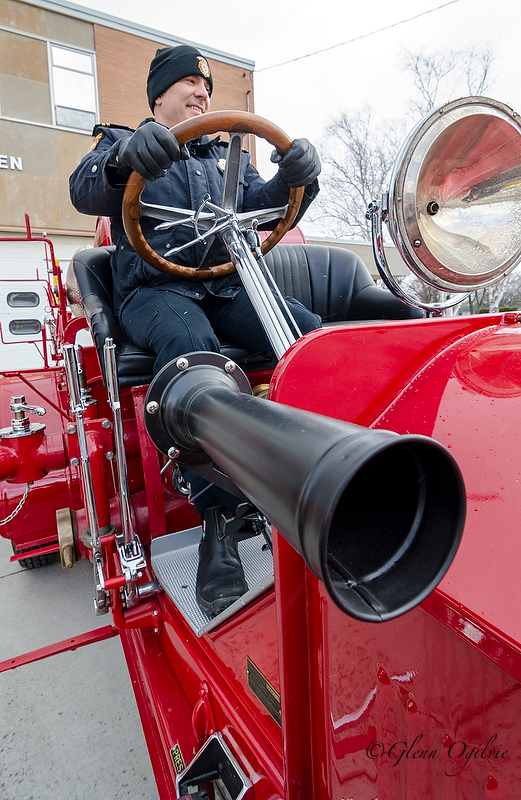 Soon, that last ride may be taken in a fully renovated 1921 LaFrance. The proud old engine might also be used for civic parades and firefighter funerals. 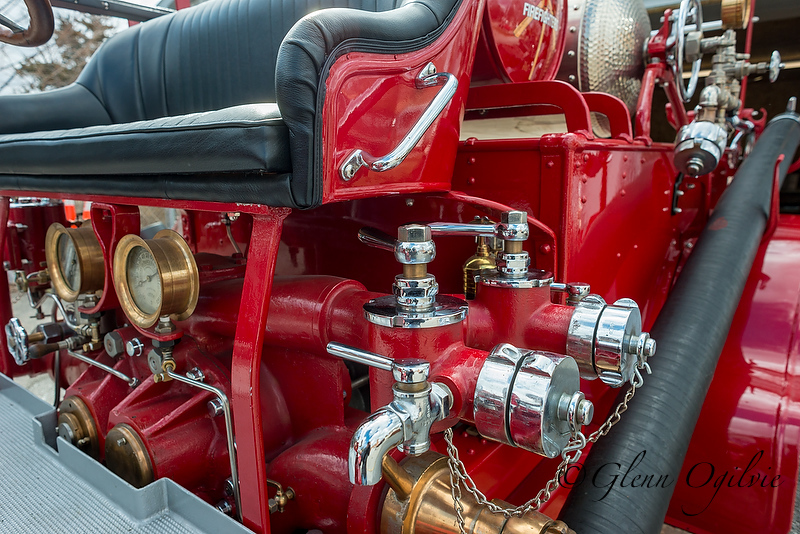 There was no wasted space onboard the 1921 American LaFrance fire truck. Tanks on the old truck were used to hold vinegar and baking soda, which when combined created firefighting foam. Public education officer Mike Otis takes the wheel of the 1921 fire truck at the East Street fire hall. 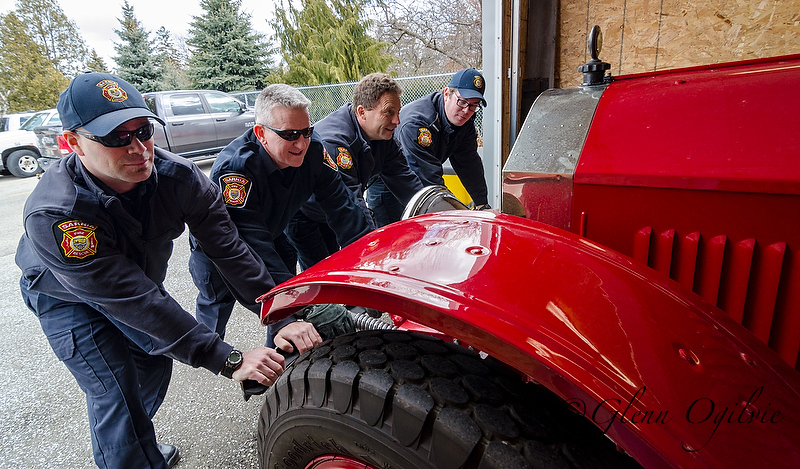 City firefighters, from left; Eric Morris, Mike Land, Hanry Bruinink and Travis Chabot, roll the vintage fire truck into the garage.